Also available for a basketball or volley ball. Similar to our popular square case, this case is a stylish octagon shape. 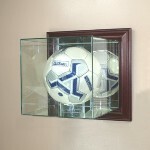 Soccer Ball display case featuring 3 mirrored back panels and a furniture grade solid wood base and real UV protected glass. The base is also mirrored so you can see the entire ball. 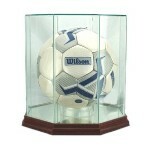 This display case is specifically sized for a soccer ball and will not hold a basketball. Inside dimensions: 9 x 9 x 10. Wall mount Soccer Ball glass display case featuring a mirrored back panel, a furniture grade wood frame and real UV protected glass. This display case is specifically sized for a soccer ball and will not hold a basketball. Price includes 1 free nameplate. Inside dimensions: 10 x 11 x 10. Our unique hinged design allows for easy access. Mounting hardware is included.